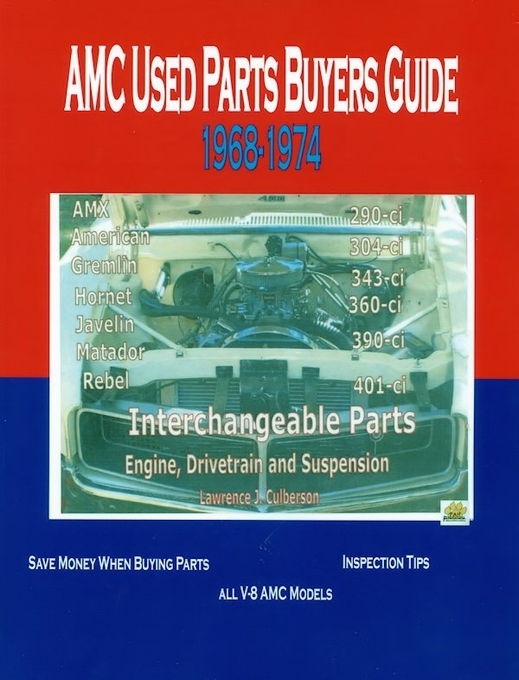 NOTE: This interchangeable parts buyer's guide covers AMC V8 models only. Other AMC engine types are not covered. These powerplants were pure, all red, white and blue American Motors. So where did these rumors come from? AMC did use other manufacturer's parts. Did you know that your AMC used Ford-built starters and carburetors, Chrysler-built transmissions, and GM-built distributors? Does that mean that a transmission for a 360 Dodge will fit your 360 Javelin? No! But do you know what parts will? Why can't you install 1969 heads on your 1973 V-8? Will a manifold from a 390 fit my 290 c.i. V-8? AMC Muscle Cars Interchangeable Parts Buyers Guide will give you the answers. 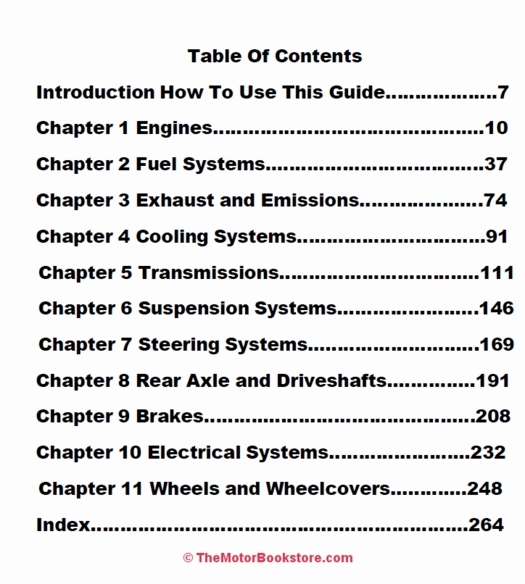 Loaded with hundreds of interchanges for your classic 1968-1974 AMC. 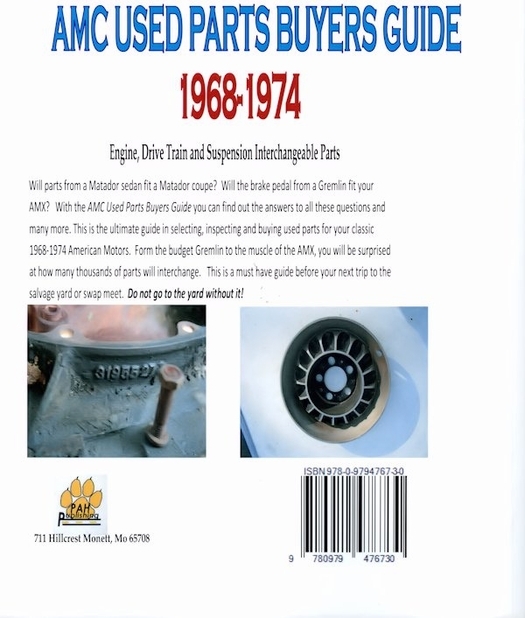 This 8.5 x 11 inch softcover salvage yard buyers guide is a well researched and effective guide to swapping parts between models of AMC cars of that specific era. I own a 1970 AMX with 390 cid engine and 4-speed transmission. I bought the car new and know its inner workings fairly well. But there are a number of things I?d like to do to the car, and that is why I bought this book. As you well know, finding 40-year old AMC parts (and parts expertise) at a salvage yard is not an easy task. Arming yourself with knowledge found in this book increases your chance of successful hunting and potentially saving some $$. A part off a Gremlin may sell for less than the same part off a Javelin though they share the same part number. Several different types and maufacturers were used. However, three basic suppliers used were; Borg Warner, General Motors and Laycock-DeNormansville. Originally a tag that was attached to the case was used to identify the transmission. However, this has drawbacks today. One, this tag was easily lost or broken. Two, it is easily changed by a sorry excuse for a seller that has only one intention to rip you off. Thus there are other ways to identify the type of transmission. However, there is no way without the tag that you can identify a particular model. The basic method used to identify a transmission is by the number of cover bolts and shape of the shifter boss. This is the point where the transmission assembly and shift lever meet. This unit was built by Borg Warner. It has a top mounted cover that is held in place by six bolts. However be aware that the T86, which was used in models earlier than what is in this guide, also used a top cover with six bolts. The T14 will have round 1/2 inch bolts that are separate while the T86 will be connected with a brace. The main case length of the T14 is 8-17/25 inches while the T86 is slightly shorter at 8- 3/25 inches. This unit has limited use on models with a V-8 and was used only in the smaller cars like American, Gremlin with the basic V-8 powerplant. Used steering columns are usually the only choice when it comes to a classic car. However, before you buy a used column you should be aware of the factors that affect their usage. Transmission type, shifter location, and steering type all greatly affect your selection. Though used columns can be a great savings over a new unit, if you're ever lucky enough to find one, you should carefully check over the column before you buy it. First, you should never buy a column out of a wrecked car. Due to the design of some columns, which collapse during a crash, it makes them unusable after the crash. A mild rear end crash or passenger side collison might make it okay, but never take one from a car that has been hit head on or rolled over. For columns after 1966 and tilt telescopic columns, this is even more vital. These columns are easily damaged, even if they are dropped, so take extra care when transporting these columns. This guide covers AMC vehicles from 1968 thru 1974 including AMX, American, Gremlin, Hornet, Javelin, Matador, and Rebel with 290, 304, 343, 360, 390, and 401 cubic-inch engines. This is the must-have guide for any AMC owner. Don't leave the yard without it! Note: for AMX, Javelin and Javelin SST parts, please refer to the AMC Body Trim and Glass Interchangeable Parts 1968-1974 salvage yard guide. Below: AMC Used Parts Buyers Guide 1968-1974 by Lawrence J. Culberson Sample Page. Copyright PAH Publishing. Ask a question about AMC Used Parts Buyers Guide 1968-1974. The Buyers Guide is exceedingly useful for cross referencing parts within the AMC family. 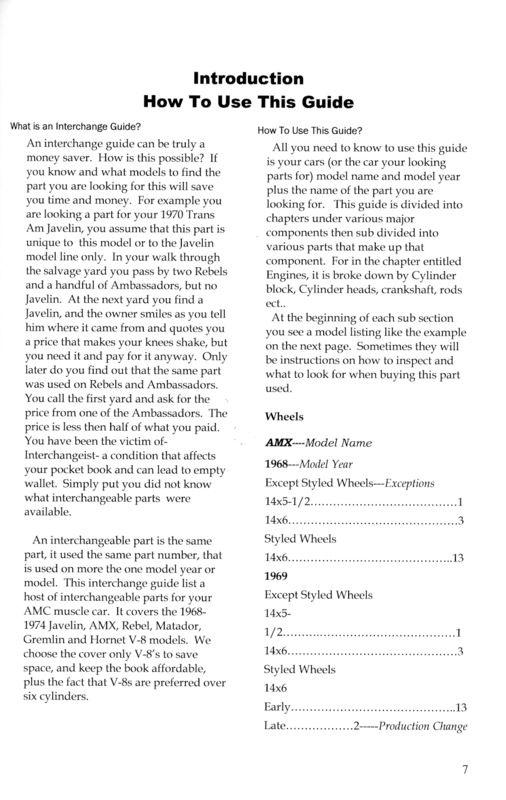 My only disappointment is I had hoped there might be a section on other car company parts that could be used on AMC autos. However, it's a lifesaver when you can't find a part specifically for your model AMC.